In 2017, the National Response Center (NRC) received over 24,000 reports of spills into the environment, which equals about 65 spills per day. This number excludes leaks and spills that companies contained on their own sites. The NRC falls under the Environmental Protection Agency (EPA). This government agency writes and enforces regulations to protect the environment from spills. The EPA holds companies accountable by imposing fines for non-compliance and spills. Here are 3 things to know concerning spill control in the workplace. Secondary containment prevents spills from spreading away from the source. In ideal circumstances, recovery of the spill is possible. Secondary containment equipment design differs according to use. Flexible containment products are made from durable PVC coated fabrics. They fold into compact and portable sizes for easy transport to a spill site. Justrite’s patented Rigid-Lock products maximizes the internal storage space for a spill. Stainless steel braces lock walls in position, but lower easily for vehicle or equipment access. Structured containment products are made of rigid polyethylene. Their most common application is for storage and handling of drums. Spill control pallets and accumulation centers feature built-in sumps to contain leaks. 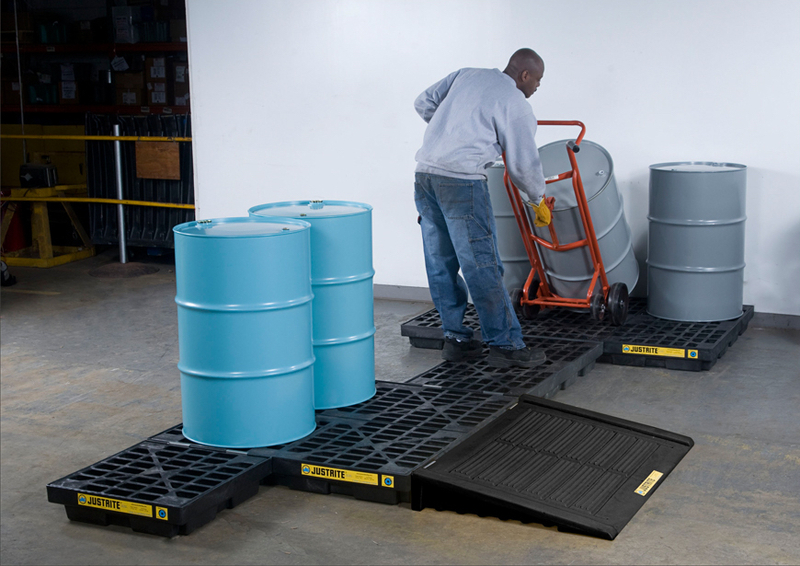 Drum caddies, spill trays and other portable containment solutions prevent spills from reaching the ground and spreading. The initial response to a spill event is critical to minimize the impact. Be prepared to handle spills by purchasing absorbent products. Universal, all-purpose absorbents absorb water, petroleum and chemical based fluids. Oil- only absorbents are hydrophobic, and only absorb oil-based products, leaving water behind. Use on land or water to clean up spills. They can absorb up to 25 times their own weight in hydrocarbons. Hazmat absorbents soak up aggressive solvents, chemicals, bases and unknown liquids. Their surfactant-treated polypropylene composition does not degrade even in contact with strong acids. Absorbent spill kits consist of any combination of spill response products. Customize a kit to your specific site requirements. Locate these at strategic points to enable rapid response to a spill event. Properly trained personnel help reduce the impact of a spill. During new employee inductions, provide information on facility hazards and emergency response procedures. Include training on spill control methods and equipment too. This helps maintain a high spill prevention standard across the company. Offer refresher training every year to keep employees up-to-date and prepared. Justrite supplies products that help companies control and contain spills. We offer market leading solutions to fit your specific needs. Order your spill control products here. Order your secondary spill containment products here.